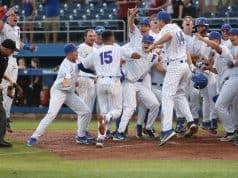 The Gamecocks came out of the gates swinging on Friday night, blasting four home runs on the way to a 6-3 win evening the series at a game apiece. Freshman Christian Scott took the ball, making his second weekend start. Scott got a loss last week on the road at Ole Miss but Kevin O’Sullivan was encouraged by his performance. Friday night Scott ran into trouble quickly. After a clean first inning Jacob Olson opened the second with a double and advanced to third on a wild pitch. Chris Cullen drove Olson in with a single before Scott could get out of the inning. The power surge began in the third. George Callil and Luke Berryhill blasted home runs to left and left center field. In the fourth inning Quinntin Perez and Cullen hit-back-to back jacks to extend the Gamecock lead to 6-0. Florida, meanwhile, struggled to get much of anything going at the plate. 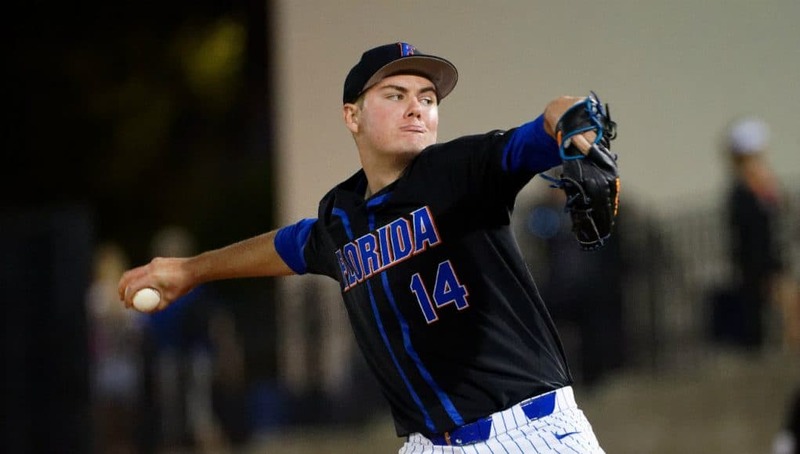 The Gators went down in order in the first inning and managed just one hit, a Jud Fabian opposite field blooper, in the first three innings and only had two hits through six innings. 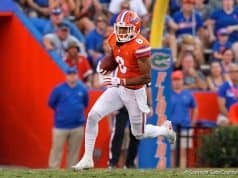 South Carolina starter Cam Tringali wasn’t throwing an overpowering breaking ball, he was hardly even throwing any offspeed and the Gators just couldn’t barrel up a fastball. The Gamecocks made a pitching change in the seventh inning, bringing in Wesley Sweatt and Florida quickly cut into the lead. Kendrick Calilao collected the third hit of the game with a leadoff single. Wesley Sweatt replaced Cam Tringali and got two quick outs but Sweatt found trouble. Jacob Young singled through the left side and Blake Reese walked to load the bases. Jordan Butler pinch hit for Brady Smith and singled to shortstop, plating Calilao. Gamecock shortstop George Callil made a diving backhanded play to keep the ball in the infield and probably saved his team a run. 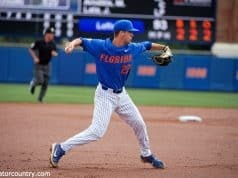 The Gators would score a run in the seventh inning but stranded three runners on base. Florida plated two runs in the eight inning to pull within three runs but couldn’t manage anything in the ninth.